For local custom channels, Pearl-2 supports live video mixing (also known as live video switching) while you are capturing, streaming and recording. Video mixing is a great way to create dynamic content for your viewers and recordings. With Pearl-2, switching happens in less than half a second ( < 500 ms)! Before you can switch between layouts, make sure you have your custom channel with layouts created. See Add or edit a custom layout. There are twothree ways to perform live switching. You can use either the Admin panel, the touch screen or the Epiphan Live control interface. Performing live switching in one interface (e.g. Epiphan Live) does not dynamically update the visuals in the other interfaces (e.g. the Admin panel and Pearl-2's touch screen). AllThe other interfaces must be manually refreshed to accurately reflect the current live switching layout information. Switching live video inputs, or video mixing, is simple and intuitive using Pearl-2's touch screen. Simply scroll to the channel you want to work on, select the layout switching mode and apply the layout you want to use. By default layout control is enabled for the touch screen, but it's possible your touch screen has been configured by the administrator to prevent layout switching, or even channel monitoring. If the instructions below don't work for you, see Pearl-2 User Guide You are here: for details on enabling layout control by the touch screen. If needed, touch the screen once to turn it on. If needed, touch your channel in the grid view to change it to individual view. If needed, touch the screen once to enable controls on the screen. Touch the button to start layout switching mode; the screen changes to display your layouts. 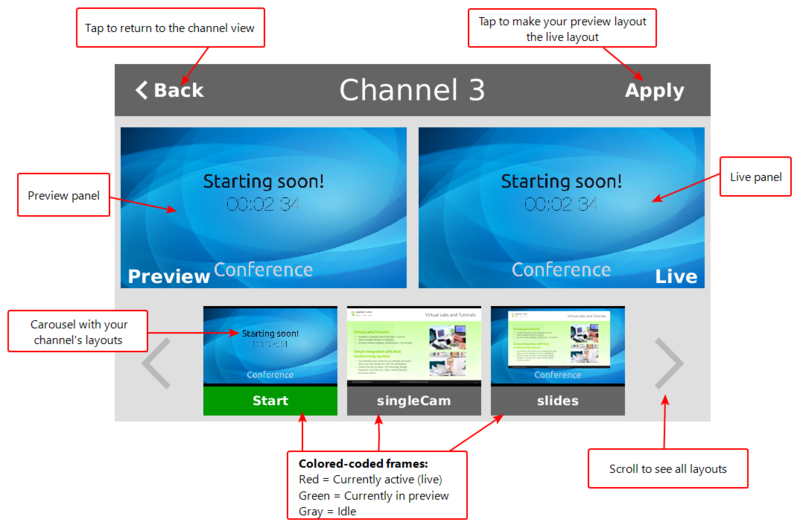 Initially, your live layout (which is displayed on the right side) is the same as your preview, or on deck, layout. It appears in the list at the bottom with a green bar on the frame to show it is in preview. Touch any other layout; the touchscreen updates to show your new layout in preview. Both the live layout and the preview layouts update at a reduced frame rate to the live stream, but fast enough that you can see what is happening. When ready, touch Apply to cause the layout currently in preview to become live; the switch happens and your screen is updated. Continue to switch layouts as needed for the duration of your event or recording. Touch Back to return to the individual view screen at any time or when you are done video mixing. Switching live video inputs, or video mixing, is fast and easy using the Admin panel. For best results, you may wish to be in a location where you can see the live action, and have a solid understanding idea of what is in each of your layouts. Good layout names can help with this. See Rename a layout. Login to the Admin panel as admin, see Connect to the Admin panel. Follow the steps in About the custom layout editor or Add or edit a custom layout to get to the channel layout editor. The currently active layout has a red button in the right-most column. Touch the empty circle for another layout to make it the active layout; the layout changes in the live stream (and recording), and the new row gets the red button. Within Epiphan Live, the Switcher view allows you to seamlessly switch between a channel's custom layouts while live streaming and/or recording. Log in to Epiphan Live; the Dashboard view opens by default. See Access Epiphan Live using a web browser or mobile device. Click the Menu icon in the upper-right corner of the Dashboard screen and click Switcher to navigate to the Switcher interface. Click the text box next to the "Switcher" header and select your desired channel from the dropdown list (the text box will appear blank if this is your first time configuring the Switcher interface). Note that in the channel dropdown list, channels containing only a single layout are grayed-out and are not selectable. After selecting your channel from the dropdown, the Switcher interface appears with all of your channel's layouts displayed along the bottom of the page. The layout currently being streaming and/or recorded is displayed in the Live view panel on the right side of the interface (see Pearl-2 User Guide You are here: ). Click on your desired layout at the bottom of the page to dock it in the Preview panel. This is the layout that will be switched into your live stream/recording. Click the Switch button in the center of the screen to switch your layout in the Preview panel into your live stream/recording. Copyright © 2018 Epiphan Systems Inc.